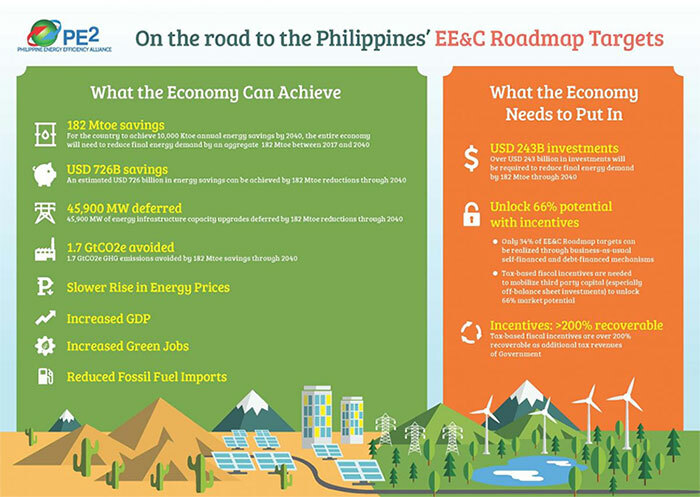 MEMBERS of the Philippine Energy Efficiency Alliance, Inc. (PE2) need to plan their staffing and capital resources based on how the proposed energy efficiency law would be able to “catalyze” investments in both the private and public sectors, the group’s top official said. “Some of these players will have to broaden access to newer technologies, staff capacity development resources, and even to project or operating capital from either debt or equity sources,” said PE2 President Alexander Ablaza in a response to questions via e-mail. TAGUIG CITY, 18 January 2019 – The Department of Energy (DOE), the Manila International Airport Authority (MIAA), the Philippine Energy Efficiency Alliance (PE2) and PLDT Inc. (PLDT) met earlier today to discuss the next steps relating to a proposed donation and installation of a PE2-led pilot cloud-based energy monitoring system in the Ninoy Aquino International Airport (NAIA) Terminal 2 (T2) building in support of the broader objectives of the DOE-led Government Energy Management Program (GEMP). MANILA -- The Bicameral Conference Committee has approved the reconciled Senate and House of Representatives' versions of a measure institutionalizing a framework to advance energy efficiency and conservation practices in the country. Senator Sherwin Gatchalian said the approval of the reconciled version of Senate Bill (SB)1531 and House Bill 8629, known as the Energy Efficiency and Conservation Act, is quite timely, especially at a time when the Philippines is experiencing sustained economic growth in the past few years. THE Philippine Energy Efficiency Alliance, Inc. (PE2) said the proposed energy efficiency and conservation law, as cleared by Congress, has narrowed the “positional gaps” between the government and the private sector, including their stand on fiscal incentives. PE2 President Alexander Ablaza said his group believes the draft law, which reconciles Senate Bill 1531 and House Bill 8629, is well-placed for approval by the President. “Both sides contributed largely to consensual draft law,” he said in a statement. SENATE OF THE PHILIPPINES, Pasay City, 16 January 2019 – The Bicameral Conference Committee convened to reconcile the disagreeing provisions of Senate Bill 1531 and House Bill 8629 met today and approved the Energy Efficiency and Conservation (EE&C) Act. 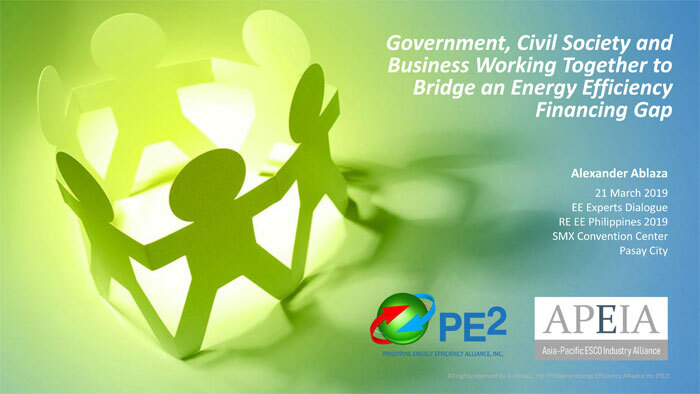 ASIAN DEVELOPMENT BANK, Mandaluyong City, 14 January 2019 – The Steering Committee and Secretariat of the Asian Development Bank (ADB) -led Asia Clean Energy Forum 2019 (ACEF 2019) received the proposal of the Asia-Pacific ESCO Industry Alliance (APEIA) earlier today for the recently organized regional group to hold a deep-dive workshop on energy service company (ESCO) and energy efficiency (EE) finance as an integral, public event during ACEF 2019, which is scheduled to be held in Manila during the week of 17-21 June 2019. SENATE OF THE PHILIPPINES, Pasay City, 10 January 2019 – The Senate Committee on Energy (COE) secretariat, the Philippine Energy Efficiency Alliance (PE2), the Board of Investments (BOI) and the Department of Finance (DOF) met earlier today to help the Senate COE reconcile the sections on fiscal incentives of the Energy Efficiency and Conservation (EE&C) bill in preparation for the scheduled Bicameral Conference Committee meeting for the said policy measure. The Senate version of the fiscal incentives section is brief and largely anchored on E.O.